National History Day contestants, please read this before you contact me. The Suffragents won the Gold Medal in US History in the 2018 Independent Publisher Book Awards and was a finalist for the 2018 Sally and Morris Lasky Prize, presented by the Center for Political History. See “Summer Camp Newsletters” and Facebook posts from book-related appearances. Reviews, notices, and articles about my books are under their titles here. My articles are here. January 29: Exhibition Opening Remarks: “Women Get the Vote: A Historic Look at the Nineteenth Amendment,“New York Society Library. February 23: “Public Values in Conflict with Animal Agribusiness Practices,” UCLA Law School, Los Angeles. March 13:“ The Suffragents,” Scarsdale Woman’s Club, Scarsdale NY. 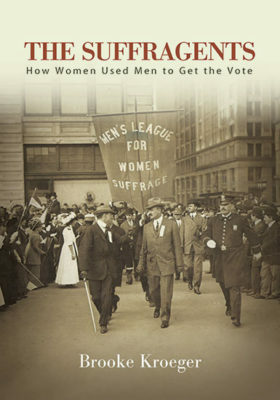 March 24: League of Women Voters, Albany County at the Bethlehem (NY) Public Library. March 25: “Judges, Lawyers, and Women’s Suffrage: Recognizing the Men Who Stood with Women on the Front Lines,” Gender Fairness Committee of the Third Judicial District, CLE, NY State Courts at SUNY Albany Law School, Albany NY. May 15: “The Republican Suffragents,” National Women’s Republican Club, New York City. August 7: “From Emma Goldman to the Marketplace of Ideas: Marking the 100th Anniversary of Free Speech at the Supreme Court,.” AEJMC, Toronto.